Industrial Control is a minority owned factory automation distributor. We are more like consultants of high tech solutions since we work with so many different industries, we might be able to help you too! Manual Assembly improvements using Datalogic Machine Vision increased a West Michigan company assembly increased throughput by 25% and achieved zero detects at the same time! Watch how the vision system is consistently checking the operators manual assembly on every step and alerts the operator quickly. Operators are much faster now just trying to get the "GREEN" Light on! How many Air cylinders do you have in your plant? 100..500..1000? The average cost is around $300 each cylinder per year to run with compressed air. 500 air cylinders x $300 each = $150,000 cost per year to run the air compressor. 500 electric Robo cylinders x $25 per year = $12,500 per year. SAVINGS = $137,500 per year in electrical expenses. This does not include the cost of the compressor, changing air cylinder seals, air leaks, poor performance, short life, and lack of control. Watch this video to learn more. Using a very small PLC with vibration sensors we can anticipate the motor bearings failing. Sensors and card for energy tracking can also be tracked by this PLC / PC. Watch the first part of this video for more information on WAGO. Wireless Humidity and Temperature control from Banner Engineering. 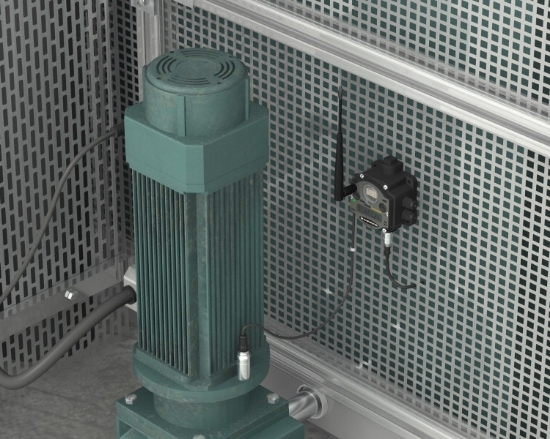 Monitoring Motor Temperature for Predictive Maintenance. How to gauge parts without a complex fixture. Using the LMI 3D Vision System, we can see the height, length, and distance (z) all at the same time with a pre-calibrated 3D vision system. No lights or lens to worry about here! 3D vision is really taking off for packaging because of the speeds the LMI 3D camera can inspect. Laser Marking your products directly is more affordable now than ever! Industrial Control has a Datalogic Laser Marker onsite in our lab for laser marking your products free of charge, or we can bring it to your plant for testing first hand. This is a video showing applications for laser marking on a variety of materials. Datalogic has a range of laser marking product up to 40W, for marking on plastics, corrugate, paper and metals. High Speed 2D and 1D barcode readers. Microscan Vision MINI is a new imager designed for high speed small areas to read barcodes and check for other defects, like bottle cap or labels missing, fill height, defects, measurements, or reading date and lot codes. Microscan's Vision MINI smart camera is the world's smallest machine vision system, now available in WVGA for high speed applications. In this demonstration, the Vision MINI inspects spark plugs for errors in manufacturing by using a NERLITE Back Light to illuminate the silhouette of the part. In this video I demonstrate how the new Microscan MINI Hawk imager decodes Intelligent Mail Barcode (IMB) at high speed. I used two IMBs: one printed on white paper, and one printed on yellow paper read thru an envelop window. The two IMBs are rotating on a circumference of 12 inches at 107 inches per second.